At the age of 38, I should be at the prime of my life. Unfortunately, as health issues have become more debilitating, most days are spent lying in a recliner watching my life pass me by. Things that I once took for granted such as: working, caring for my children, walking, or just being upright for any length of time, have become daunting tasks. The normal life that I once knew is long gone, only to be replaced by days filled with pain and fatigue, both physically and emotionally. Although I experienced symptoms intermittently over the past 15 years, I began to have severe and persistent symptoms three years ago when I had constant neck pain, pressure in my head, swallowing difficulties, numbness/weakness in my extremities, visual disturbances, and balance issues. 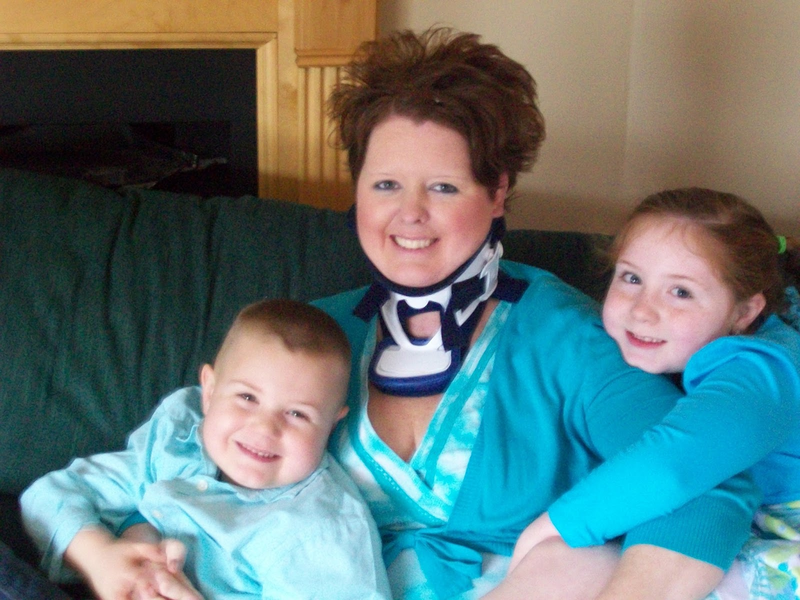 In 2010, in the midst of seeking medical attention I was diagnosed with thyroid cancer. After undergoing a total thyroidectomy I was cancer-free. The neck pain remained so I sought the help of a local chiropractor. Eight months into treatment, I began to develop severe medical issues. I could barely hold my head up, my body felt twisted, my arms and chest were numb, cold and blue, and a bone began protruding through the back of my throat. I sought the help of countless doctors telling them that it felt like “my head was falling off,” only to be dismissed or told that the issue that I had was elsewhere. In the course of a year, I underwent five major surgeries: an emergency Anterior Cervical Discectomy & Fusion (ACDF) of c5-6 for a severely herniated disc that was compressing my spinal cord; emergency thrombolysis for a Deep Vein Thrombosis (DVT) in my left arm; bilateral removal of my first ribs; and posterior revision & fusion of c5-7. Despite all of these surgeries, every symptom that I complained of (neck pain/weakness, swallowing difficulty, numbness, weakness & temperature changes in all extremities, blurred vision, feeling of cervical instability, spastic muscles, and pressure in my head) continued. I was referred to Physical Therapy. I sought the help of a highly skilled therapist at CPTE in Merrimack, NH, John Peterson, and finally received validation for the first time in over a year. His evaluation revealed that there was in fact, upper cervical instability and he quickly referred me for further evaluation by a specialist. Unfortunately, every specialist that I went to locally (in NH), at Dartmouth, and in Boston quickly dismissed me. In the meantime, my condition has progressively worsened to the point of having to spend the majority of my day in a recliner, because it is the only position that supports my head and neck while removing pressure from the base of my skull and spinal cord. I have to wear a rigid neck brace a majority of the time, because it is difficult to hold my head up. The recliner has been my “bed” for the past 18 months, because it is the only place that I can sleep while wearing my neck brace. Although there have been many days that I have wanted to just give up, my faith has given me the strength and determination to figure this out and to find a doctor that can help me. After a year of relentless research, I did just that. In early April, my husband and I packed up our family and headed for The Metropolitan Neurosurgery Group in Bethesda, MD (he also has an office located at DCH in Lanham, MD) to see Dr. Fraser Henderson, a leading authority on Neurosurgery and genetic conditions of the craniocervical junction. After 2 years of being blown off by countless specialists, all it took was 800 miles, 2 days and MANY prayers to finally get answers and 100% validation for what I have been telling doctors. Upon conducting a thorough exam, undergoing the appropriate diagnostic imaging, and reviewing my medical history, my medical mystery was solved. Dr. Henderson confirmed that I have Craniocervical Instability (my skull is shifting off my spine), Chiari malformation (the bottom of my brain is herniating below my skull opening and restricting my cerebrospinal fluid flow), Postural Orthostatic Tachycardia Syndrome (POTS) –(dysfunction of my central nervous system), Tethered Cord Syndrome (the band that connects my spinal cord to my tailbone has thickened which is causing my spinal cord to be tugged downward), Basilar Invagination (the bone of my c2 vertebrae is poking into my brainstem causing ventral brainstem compression), Foramen Magnum stenosis (the opening of my skull is too narrow which is compressing my brainstem and spinal cord), Deformation of the clivo-axial angle (causing brainstem compression), and Instability of the c4-5 vertebrae. Dr. Henderson explained that the source of these problems is Ehlers-Danlos syndrome-hypermobility type, a rare connective tissue disorder that causes weak collagen throughout the body. This leads to laxity of ligaments, muscles, skin and blood vessels. The fragile skin and unstable joints are the result of faulty collagen, a protein that acts as glue in the body. There is no cure. It has been estimated that Ehlers-Danlos Syndrome (EDS) affects more than 1 in 5,000 people worldwide, but experts think that's conservative. Only 5% of EDS sufferers are eventually diagnosed with Ehlers-Danlos Syndrome (EDS). “1 in 10 Americans have hypermobility connective tissue disorders,” according to EDS expert and neurosurgeon, Dr. Fraser Henderson. “That's 30 million people with a hypermobility connective tissue disorder - and we don't know exactly how many of them are afflicted with EDS. Many of them suffer daily with invisible pain and chronic fatigue. Each year in the U.S., 650,000 additional sufferers are undiagnosed or misdiagnosed due to physician oversight or lack of knowledge about the condition.” EDS causes painful dislocations of the joints and can lead to hematological problems such as DVTs. The hypermobility and dislocations of the joints can lead to Craniocervical Instability, where the head is wobbly on the spine. You can think of it like a wet paper bag trying to hold up a bowling ball. Trying to hold my head upright is exhausting. Having instability at that level is extremely dangerous as well. Any sort of fall or car accident could cause paralysis or death. EDS is a major cause of Chiari Malformation, another overlooked and misunderstood condition that causes severe debilitation. Chiari occurs when a portion of the cerebellum pushes down through the opening at the base of the skull and compresses the brainstem. There is a disruption of the cerebrospinal fluid flow through the skull opening. This results in neck pain, headaches; changes in vision, breathing pattern, balance, coordination, strength and sensation. There is no cure. Surgery is the only treatment to re-establish normal cerebrospinal fluid flow and stop the progression of neurological damage. There is no known cause or cure for chiari and surgery is the only treatment. Chiari affects an estimated 1 in 1000 people, yet those afflicted with this condition find it extremely difficult to obtain adequate care and knowledgeable physicians. Most cases of Chiari are left undiagnosed, or worse, misdiagnosed as multiple sclerosis, migraine, fibromyalgia, or psychiatric disturbances, a common error that prevents physically ill Chiari patients from getting the kind of help they need and deserve. The frustration of navigating the arduous medical web is not only exhausting, but demoralizing. I have sought the help of top-notch neurosurgeons and specialists, locally, at Dartmouth, in Boston, and in NY. Despite clearly articulating my symptoms and providing supporting information about craniocervical instability, Chiari and EDS, most doctors spent less than 10 minutes with me, never examined me, quickly looked at inappropriate imaging, and then dismissed me. When I challenged them I was met with even more resistance. It was so refreshing to be treated with empathy and respect by Dr. Henderson. He is not only a highly skilled neurosurgeon, but he is truly a genuine and compassionate human being whose passion is to help people that suffer from EDS and Chiari. There needs to be more awareness about EDS and Chiari in the medical community. When the impairments that EDS and Chiari cause impact the entire body, it would seem like all doctors should be aware of these conditions. For example, in my case alone, having my neck hyperextended for 5 hours during my thyroidectomy was not the best for EDS and Chiari. Had the surgeon been aware, other precautions may have been taken. Since EDS impacts blood vessels, it would help phlebotomists to understand why it is so difficult to draw my blood and it would explain to an anesthesiologist why it took him 19 attempts to start an IV. More importantly, when an EDS patient has hypermobile joints and Chiari Malformation, nobody should be manipulating their neck. When Chiari is almost as prevalent as Multiple Sclerosis, you would especially think that Neurologists and Neurosurgeons would understand how it manifests into such a serious neurological problem, not just minimize it as something that causes a headache. Although I am so grateful to have found Dr. Henderson, I find it absurd that I had to go so far for help. Even though it took over 15 years to be correctly diagnosed, I feel extremely blessed. Through my research and connecting with people online, so many share similar journeys as me. It has been a very lonely & difficult 2 years fighting to make people believe that this is very real. I am so grateful to have gone to such a knowledgeable Physical Therapist, who not only took the time to listen to my story and do a thorough evaluation, but he also validated every symptom that I presented and objectively agreed that there was upper cervical instability. He went the extra step and referred me for prompt medical attention; however his assessment was dismissed as quickly as mine was. He continued encouraging me to find a specialist that would take me seriously and reminded me that I was right and knew my body best. He said one of the most poignant things to me in the midst of my anguish as I shared with him how one of the specialists refused to even read his PT report citing that he was a doctor so why would he listen to a PT. He said, “This isn’t about being right…I would gladly be wrong…this is about helping you as the patient to get the help that you desperately need.” If only the egos of so many specialists didn’t stand in the way of wanting to help me like John did. I am also fortunate to have a PCP who has been on this journey with me for the past 15 yrs. Although he has never encountered a patient with EDS, Chiari and all of the accompanying issues, he has never discounted my symptoms. So many doctors are quick to label a patient as “anxious” or “psychosomatic” when they can’t find the root cause or quickly dismiss them instead of admitting that they don’t know what is wrong. As my symptoms have become more debilitating over the past 2 years and I began doing my own research, Dr. (James) Fitzgerald has been 100% supportive in allowing me to advocate for myself. When I brought him supporting evidence as to why I thought I had EDS, Chiari, POTS, and craniocervical instability, along with the specialists that I wanted to be referred to, he took the time to listen, and humbly admitted that I was teaching him about these conditions. He has always treated me as an equal part of my treatment team and respects my intelligence. EDS patients are faced with many challenges due to this devastating disorder. Many challenges are physical, but there is an added burden of emotional and mental stress due to a lack of understanding. I don’t feel like anyone REALLY understands what I am going through. To most people I look perfectly healthy, but most days I smile through the debilitating pain, neurological deficits and exhaustion that EDS causes. "Invisible Illnesses" are the worst to have because not only have I had to fight to get the medical world to believe that all of my symptoms are in fact real, but I have to fight against the scrutiny that comes from having something that isn’t obviously seen by others. Being the overachiever that I am, I tend to push too much and then end up laid up for days.It is emotionally exhausting having to explain my condition and to convince others that I'm not making it up. Being the overachiever that I am, I tend to push too much and then end up laid up for days. Although nobody can truly understand what I'm going through I am blessed to have a husband and kids that love me unconditionally and friends that have been there to listen to my frustrations over the past few years. It can be a very lonely place to be...so for that I am grateful♥from having something that isn't obviously seen by others. It is emotionally exhausting having to explain my condition and to convince others that I'm not making it up. Being the overachiever that I am, I tend to push too much and then end up laid up for days. Although nobody can truly understand what I'm going through I am blessed to have a husband and kids that love me unconditionally and friends that have been there to listen to my frustrations over the past few years. It can be a very lonely place to be...so for that I am grateful♥ People don’t see that side of me though. Although I have an extremely supportive husband and 2 kids that love me unconditionally, they don’t always understand when I can’t do something. I have 2 small children that need and deserve a mother that can give them what they need. As I watch my husband having to do the things that I once did after working all day, I feel such guilt. Not only does he have to take on so much more, but I can’t even contribute to the financial needs of our family anymore, since I had to stop working 2 years ago. The mountain of medical bills that have accumulated has created such a financial burden and now we have several trips to make to Maryland. Through this difficult time I have to rely on my faith that everything will work out. The emotional toll that EDS and Chiari can take on individuals and their families can be life-altering as well. While it is a relief to finally have the diagnoses to confirm why I have been so ill for the past few years, it raises a certain amount of anxiety about what our future holds. After working so hard to obtain a Master’s degree and to be such a highly motivated individual who thrived on being involved in everything and fulfilling every demand that was placed on me, it is so hard for me to be in a position where I can barely hold my head up and require help for the simplest things. As a counselor, advocating for others was my passion. Now I am the one that needs help. While the road has been long, my journey has just begun. I have 3 major surgeries ahead of me. In June I'll be having the biggest surgery - a brain decompression & craniocervical fusion (fusing my skull to the c2 vertebrae). Then I will eventually need to have my tethered cord released & my c4-5 vertebrae stabilized. If anyone is able to help restore me I know that it is Dr. Henderson. I now feel strongly about raising awareness about these debilitating conditions, because even if I go through these surgeries and regain functioning, my fight may never be over. Due to the genetic nature of EDS, I now have to worry about my children possibly having it. Just from a brief review of medical history, Dr. Henderson suspects that my 7 year old daughter most likely has it. After all I have endured to get the proper diagnosis and treatment; I will fight to make sure that she never has to suffer the way I have. When a condition such as EDS or Chiari impacts millions of lives, all medical specialties need to be aware of what to look for, how to properly test and diagnose and who to refer patients to in order to get the help that they need in a timely manner. Funding for more research is desperately needed as well. It is now my mission to bring awareness to the medical community and to advocate for others so that other families don’t have to experience what I have. I hope that my story may help others who have experienced similar symptoms. The best advice that I can give is to trust your intuition. You truly are the expert on your body. If you feel like something is wrong, be your own advocate and keep searching until you get answers. Although it hasn’t been easy, making the trip to Maryland was the best thing I ever could have done. I am eternally grateful for being led to Dr. Henderson. Until my surgery at the end of June, it still means that many days will be spent lying in the recliner and trying to make it through each day, but I now have hope!